The streets of Athens were filled with riot police again on Thursday. 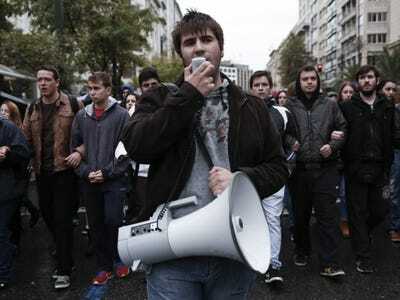 Students gathered outside the University of Athens to demand lower tuition and protest education cuts. They were also commemorating the 1973 student uprising that led to the fall of the former military junta. That’s when things got ugly. Riot police showed up and reportedly used tear gas and stun guns. The protests coincided with new economic data announcing the official end of Greece’s 6-year recession. It’s now the fastest-growing economy in Europe, but things aren’t really looking good. Unemployment is still 26.6 per cent, the economy is way smaller than it was before the crisis, and it could take decades to get back to pre-recession levels, BI’s Mike Bird reported. That, and a university-wide student lock-out ahead of the anniversary of the Athens uprising, led students to the streets.